Stockport has a current population of 289,000 people. 1 in 3 adults have three or more lifestyle risk factors and 15% report low mental wellbeing. There are at least 93,500 with one or more long term health conditions. Over half the population as a whole are not active enough. More than 200 deaths a year could be prevented if every adult met the recommended target. 64% of the population are overweight or obese. Hypertension is the most common long term condition with 44,700 having it on their medical record. Life expectancy is increasing and is similar to the overall England average for both men and women. 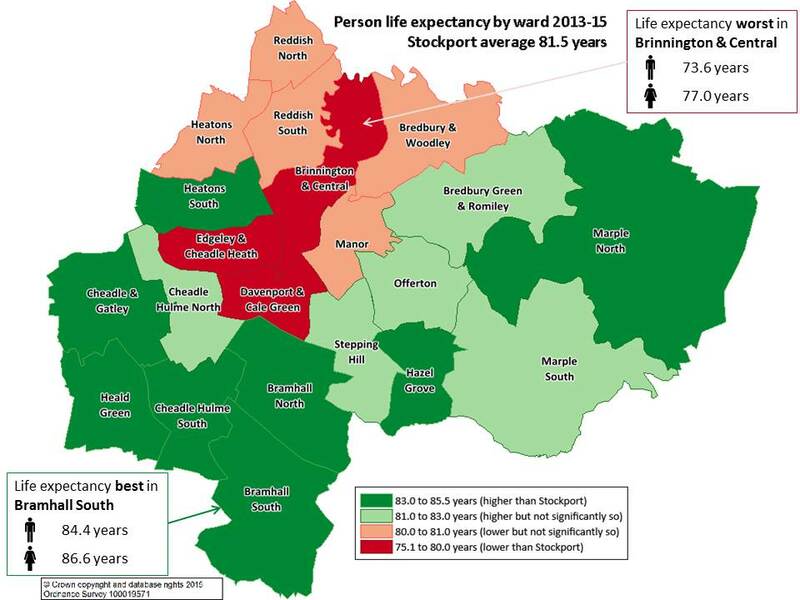 Those in the more deprived areas have worse health and wellbeing than residents in the rest of Stockport. Increase levels of physical activity as an effective preventative action at any age. Focus on improving healthy life expectancy for all as the priority, focussing especially in the most deprived areas and in a person and family centred way. Work to integrate and improve care systems, especially minimising the use of unplanned hospital care – ensuring that the healthy economy is sustainable and prevention focussed. Use JSNA intelligence to inform the appropriate levels of response to the needs of the vulnerable and at risk groups.